A thick fog envelopes the streets of London and nefarious agents set about their evil plots and schemes. Murder most foul rears its ugly head and baffling mysteries confound the good men of Scotland Yard until they've no recourse by to call upon the greatest consulting detective of them all, Sherlock Holmes of 221B Baker Street. In this seventh volume of Airship 27 Productions' best-selling series, Sherlock Holmes and his steadfast companion, Dr. Watson, set out to solve four brand new mysteries, each a unique puzzle unlike any they've encountered before. From confronting the legendary Spring-Heel Jack to battling a fictional foe become real, Holmes and Watson will have to employ all their considerable talents to unravel these complex and insidious crimes. 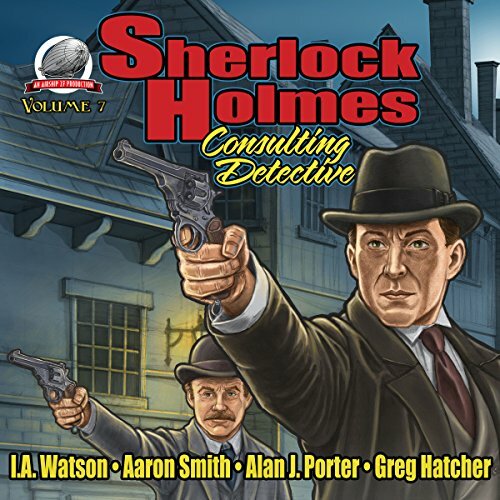 Writers IA Watson, Aaron Smith, Alan J. Porter, and Greg Hatcher have offered up a quartet of intriguing mysteries that will challenge even the most ardent listeners as they attempt to match wits with Arthur Conan Doyle's ageless hero, Sherlock Holmes!